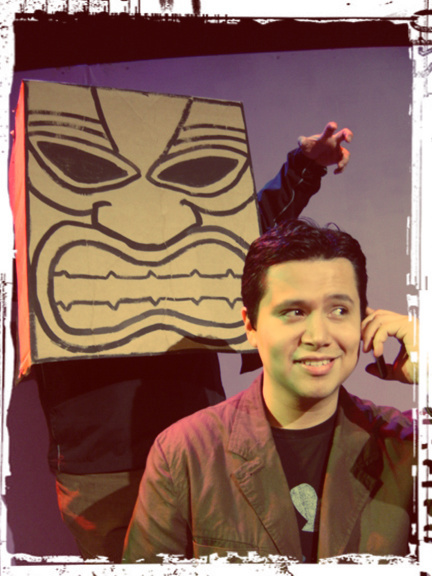 Audacity Theatre Lab gets Tiki with it at Out of the Loop. If there’s one thing theater sometimes needs, it’s a lighter side. In a landscape strewn with weighty dramas, the occasional quirky comedy is an oasis for the laughter-famished gut. And in I Have Angered a Great God, Audacity Theatre Lab gives the audience that healthy dose of comedic nourishment they so desperately need. 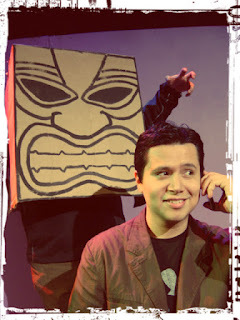 The brainchild of Audacity founder Brad McEntire, I Have Angered a Great God takes the audience on the flashback-laden tale of Robert von Ritchie Ritchie (Oscar Contreras), as he tries to figure out just what he did to spark the wrath of an ancient Tiki god (Jeff Hernandez). Much of this introspection is accomplished in the office of his therapist (Jeremy Whiteker), who coincidentally also happens to treat Robert’s now ex-girlfriend, Martha (Angela Parsons), and the Great God itself. Due to a crippling selfishness, Robert is oblivious to how his actions affect those around him, particularly the Great God. Naturally, he comes to realize his mistake and make amends, but not until after most of his friends and family have paid the price in his stead. Opening with a rapped prologue complete with cardboard cut-out Tiki gods, McEntire quickly establishes the expectations for the performance. It’s gonna get a little weird…but, in a good way. Jokes pepper the non-sequential, sometimes hard to follow, script, and while they don’t always fully land with the appropriate oomph, McEntire’s offbeat sense of humor still manages to shine through. Parsons and Whiteker bring substantial comedy chops with them to the production, and it shows. With all apologies to Hernandez, whose lines under his giant, cardboard Tiki head consisted of a series of grunts and barely decipherable words, Parsons and Whiteker stood apart from the bunch when it came to communicating McEntire’s unique comic voice. McEntire himself, who delivers the opening rap and plays several other minor characters, channels Graham Chapman with his deadpan delivery. The purest measure of a truly gifted comedic performer is their ability to make any character funny. McEntire does that with his turns as a barista and a MENSA rep. I Have Angered a Great God is a quirky romp through the human psyche, externalized in the visage of a blue-clad Easter Island escapee. The comedy is sometimes bungled in the delivery, but enough of it connects that this remarkably peculiar, yet boldly inventive, story comes out all smiles. ◊ I Have Angered a Great God plays at the Addison Theatre Centre's Stone Cottage.